TS Vidya Volunteers (VVs) Bhadradri (Kothagudem) District Application form at cdse.telangana.gov.in, Merit List /Selection List 2017-18 , Bhadradri (Kothagudem) district Vidya Volunteers Online Application Form 2017, TS Online Application Form for VVs Recruitment 2017 and District-wise, School-wise VVs Vacancies, Schedule,VVs Recruitment Schedule,Guidelines, Instructions, Bhadradri (Kothagudem) District official DEO Website, Bhadradri (Kothagudem) VV's Appointment 2017 Orders, Bhadradri (Kothagudem) Schools Vidya Volunteers vacancies list, applications, Merit List,Selection List , Bhadradri (Kothagudem) VVs 2017-18 selection list,Bhadradri (Kothagudem) Vidya Volunteers (VVs) merit list 2017, Recruitment of Bhadradri (Kothagudem) online applications Vidya volunteers merit list , Bhadradri (Kothagudem) VVs selection list ,Bhadradri (Kothagudem) vvs selection , Bhadradri (Kothagudem) vidya volunteers merit list, Bhadradri (Kothagudem) Vidya Volunteers appointment list will be provided here. Bhadradri (Kothagudem) District Vidya Volunteers (VV's) Recruitment Notification 2017:Telangana State government has decided to appoint 11428 Vidya volunteers for the academic year of 2017-18. The Chief Minister asked the officials to take immediate measures to appoint Vidya volunteers. According to Education department officials, the total teacher vacancies are raised to 11428 and these vacancies to be filled up with the VVs for 2017-18 with the increased honorarium Rs.12000/- (Rupees Twelve Thousand only) per month per month. 1.Candidate shall apply online and submit a signed print out of the application he / she uploaded along with the certificates required to the Mandal Educational Officer. 2. The Mandal Educational Officer shall cause verification of the applications with reference to the Certificates enclosed and submit to the District Educational Officer duly countersigned. Note: Engaging of Vidya Volunteers in Agency area shall be from local ST candidates only. If local ST candidates are not available ,then other ST candidate from Agency Area and later non-ST candidates residing in the Agency area shall be considered . 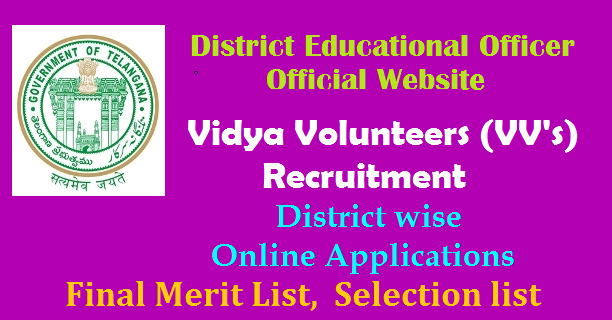 Search Tags: Bhadradri (Kothagudem) district Vidya Volunteers Online Application Form 2017 cdse.telangana.gov.in, TS Online Application Form for VVs Recruitment 2017 and District-wise, School-wise VVs Vacancies, Schedule,VVs Recruitment Schedule,Guidelines, Instructions, District wise DEO Websites, Vidya Volunteers Online Application Form. Bhadradri (Kothagudem) Vidya Volunteers VV's online application form, Subject wise Final Merit List, Selection list 2017 District wise, Subject wise Vidya Volunteers Merit List in Telangana. TS Vidya Volunteers Merit List, Bhadradri (Kothagudem) District Online VVs Merit List 2017, Bhadradri (Kothagudem) VVs Recruitment Results 2017, TS Engage of Vidya Volunteers Merit List, District-wise VVs Selection List, Bhadradri (Kothagudem) District DEO Websites, Subject wise and Medium wise Merit List of Vidya Volunteers Bhadradri (Kothagudem).